When to Replace your Garage Door? / Comments Off on When to Replace your Garage Door? Your garage door was new when you bought your home, 15 years ago. Or perhaps you had a garage door installed more recently and corners were cut, leaving you with a door that requires frequent repairs. Whatever your situation, the decision to replace your existing garage door is an important one, and weighing your options is essential. 1. Security first: Your garage door provides easy access to your home. Because many homeowners use the garage door as the primary entering and exiting point, keeping it secure is a must. Installing a new door with an opener that has secure access codes ensures that old, faulty mechanisms are replaced and keeps your home as secure as possible from unwanted intrusions. 2. Prevent injuries: Because of their weight, old or malfunctioning garage doors can cause serious injury to anyone crossing their path. New garage doors include electronic eyes that sense when someone is beneath and pause or raise the door, keeping you and your family safe. 3. Store items securely: Extreme heat or cold can damage many types of items, from power tools to packed away clothing. Installing an insulate garage door with a thermal barrier can help to keep stored possessions safe from extreme temperature changes. 4. Lower heating and cooling costs: Insulated garage doors also help you to retain heat in the winter and cool in the summer, cutting down on your heating and air conditioning bills. Particularly if you use the garage as a workshop, climate control is an essential consideration, as the garage functions as an additional room in your home. 5. Increase your home’s value: Even if selling your home is the furthest idea from your mind, increasing the value of your property is always an intelligent choice. Investing in a new garage door in a modern or classic style keeps your home desirable should you suddenly need to put it on the market. 6. Beautify your home: Your garage door is one of the first things that visitors or passersby see, particularly if it is attached to the front of your home. Make a great impression with a statement garage door using custom windows and colors that reflect your family’s unique style. 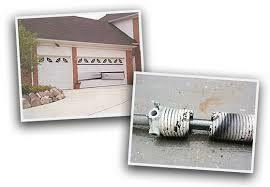 Replacing an old garage door may not be the first job on your maintenance list. However, the benefits of a new garage door often outweigh the investment and can make your home safer, more valuable, and more stylish for years to come.